A CNC programmer and operator in manufacturing until several years ago, Niko Nicolaides pivoted from his previous career, moving in a decidedly analog and hand-craft direction to focus his talents exclusively on bladesmithing and the creation of custom chef knives. 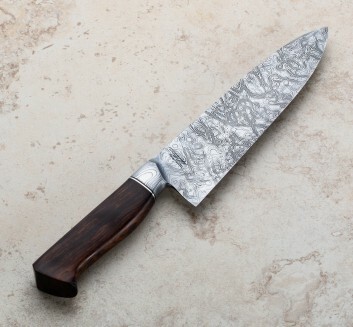 Damascus making and blade forging are the focal points of Niko's work, experienced most often in the form of integral-construction, damascus kitchen knives. Natural handle materials shaped in Western fashion with subtle, purposeful details adorn the hand-forged blades, each knife bringing its own unique look and feel. At his shop in Detroit, Michigan, Niko now creates the tools that he dreamed of using as a cook in his high school and college days, at a level he may never have imagined back then. Thin, balanced and beautiful, Niko produces outstanding knives for professional and home cooks alike.